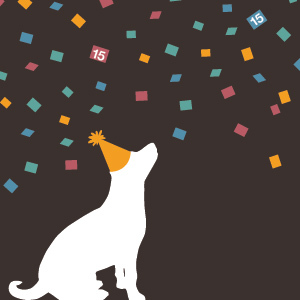 Ruff Haus Design is celebrating its 15th year and I am feeling incredibly thankful for all the wonderful people I have had the opportunity to work with over the years. Some clients have slipped away for various reasons, but most of our relationships span many years. We actually still work with our very first client, Simulation Training Systems. They are a family owned and operated business and I feel so much a part of their family. We have celebrated and cried together and I wouldn't have it any other way. While we always remember that Ruff Haus is providing a professional service for our clients, we never forget that it's our relationships that sustain us. Rather than celebrate our accomplishments, we celebrate our relationships–our relationships with clients, vendors, freelancers and staff. The people we work with day in and day out entertain us, educate us, surprise us and even sometimes frustrate us, but in any real relationship you always need a little bad to make the good truly great. Without all of you, work would just be work. Thank you for 15 wonderfully rewarding years! P.S. This information was provided by Ruff Haus Design - Your Loyal Marketing Companion. Established in 1997, we are a special breed of full service graphic design company that works with a premier pack of clients. We bring a fresh outlook and tail-wagging enthusiasm to your marketing program.